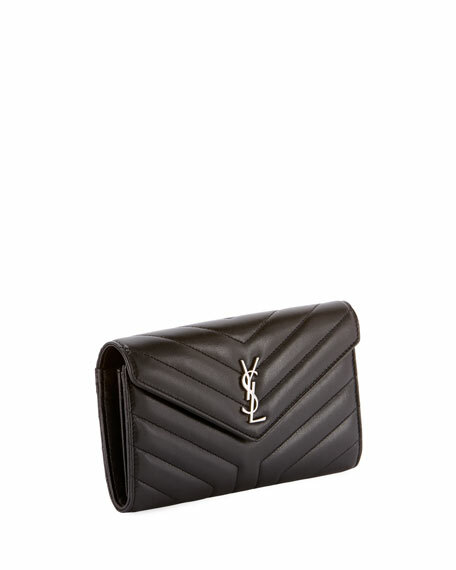 Saint Laurent Y-quilted calfskin leather wallet. Chloe leather wallet with antiqued brass hardware. Bi-fold construction; snap closure. Exterior, front flap pocket with layered stitching. Hanging ring and tassel detail. Interior, two bill and 11 card slots. 4.8"H x 4.2"W. "Marcie" is made in Spain. Longchamp shoulder bag in lambskin leather with black nickel hardware. Crossbody chain, 22" drop. Full flap front with turn-lock closure. Longchamp shoulder bag in lambskin leather with black nickel hardware. Crossbody chain, 22" drop. Full flap front with turn-lock closure. Interior: horse-motif lining, one zip pocket, 6 credit card slots, and one slip pocket. Exterior: two pockets. 4.8"H x 7.8"W x 1.3"D. Imported. Marc Jacobs wallet in colorblock saffiano leather with polyurethane coating. Top zip pocket with tassel pull. Double J detail at center front. ID window and two card slots. 3.3"H x 5.1"W x 0.4"D. Imported. 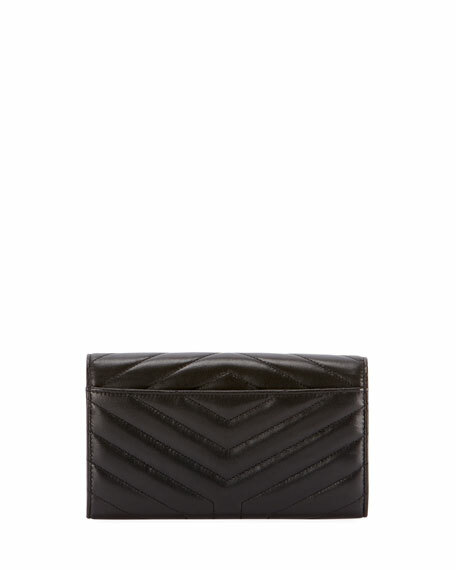 MICHAEL Michael Kors quilted metallic leather continental wallet. Removable wristlet strap, 6" drop. Zip-around top closure. Logo lettering at front. MICHAEL Michael Kors quilted metallic leather continental wallet. Removable wristlet strap, 6" drop. Zip-around top closure. Logo lettering at front. Interior, one zip coin pocket, 5 slip pockets, and 17 card slots. 4"H x 8.3"W x 1"D. "Money Pieces" is imported.